Jordan Bell, who played for the NBA champion Golden State Warriors last season, is shown on the right with teammate Roschon Prince after team won at the buzzer over St. John Bosco in 2013 CIF Southern Section Open Div. playoffs. Photo: Ronnie Flores. In the most populous state in America, the stats show just how difficult it is to play a single game in the National Basketball Association since there’s been less than 500 to do it from the Golden State. Mater Dei of Santa Ana may not have had an eventual superstar, but the Monarchs’ total of nine alums who have logged NBA minutes nips the total of eight by Crenshaw of Los Angeles, McClymonds of Oakland and Long Beach Poly. The Jackrabbits, who are are well ahead of any other school in the state for NFL players, just got their eighth with Jordan Bell of the Golden State Warriors. WE HOPE YOU ENJOY THIS FREE STORY ON CALHISPORTS.COM. WE HAVE STATE RECORD LISTS IN BOYS BASKETBALL, FINAL STATE RANKINGS & ALL-STATE TEAMS FOR THE LAST 30 YEARS AND MUCH MORE THAT ARE FOR GOLD CLUB MEMBERS ONLY. HELP US OUT BY SIGNING UP NOW. YOU CAN CHECK IT OUT FOR NEWLY OFFERED RATE OF $3.99 FOR ONE MONTH. FOR DETAILS, CLICK HERE. Coming off the July evaluation period (and likely the last of its kind without Las Vegas to close it out in the foreseeable future) and a skills camp at Beckman of Irvine put on by up-and-coming basketball scout Devin Ugland, we decided to take a look at the high school programs around the state that have produced the most NBA players. Considering the sheer numbers of teams (over 2,000) and players (over 20,000) that were participating in Las Vegas and the 90 players who participated in the Hoops by Ugland Skills Academy, the numbers show just how incredible the odds are to make it to the NBA. Even though California is in a NBA renaissance with a crop of great players from the state including the last two NBA MVPS (James Harden from Lakewood Artesia in 2018 and Russell Westbrook of Lawndale Leuzinger in 2017), California has produced less than 450 NBA and ABA players dating back to the beginning of modern pro basketball. In a state where over 35 million people reside, we haven’t even produced 500 NBA basketball players yet, and it’s not because we don’t produce excellent talent. It’s just that difficult to get that far in the game. When taking a look at which programs have produced the most of those nearly 450 players, it’s not surprising that the schools that have won the most CIF state titles and/or have been perennially the strongest have produced the most NBA talent. Santa Ana Mater Dei has produced the most NBA players (nine) and also the most CIF state championships (11). Ironically, L.A. Crenshaw has produced the same number of state championships as it has NBA players. Stanley Johnson was the 2014 Mr. Basketball and later became the ninth alum from his school to play in an NBA game. Who will be the 10th? Photo: Willie Eashman. Santa Ana Mater Dei (9): Cedric Bozeman, LeRon Ellis, Reggie Geary, Stanley Johnson, Jamal Sampson, Miles Simon, D.J. Strawberry, David Wear, Travis Wear. L.A. Crenshaw (8*): Stanley Brundy, Darwin Cook, Tremaine Fowlkes, Marques Johnson, Kevin Ollie, Robert Smith, Stevie Thompson, John Williams. Oakland McClymonds (8): Odis Allison, Will Cherry, Antonio Davis, Joe Ellis, Jim Hadnot, Bill Russell, Paul Silas, Nate Williams. Long Beach Poly (8): Jordan Bell, Mack Calvin, Tyus Edney, Bobby Jones, Ozell Jones, Ben McDonald, Michael Wiley, Morlon Wiley. Compton (7): Demar DeRozan, Ron Knight, Tito Maddox, Louie Nelson, Woody Sauldsberry, Jose Slaughter, Jeff Trepangier. Inglewood (7): Noel Felix, Jason Hart, Jay Humphries, Ralph Jackson, Harold Miner, Paul Pierce, Reggie Theus. Lakewood Artesia (6): Tony Farmer, James Harden, Jason Kapono, Charles O’Bannon, Ed O’Bannon, Tom Tolbert. Compton Dominguez (6**): Cedric Ceballos, Tyson Chandler, Pat Christopher, Jordan Hamilton, Dennis Johnson, Tayshaun Prince. L.A. Jefferson (6): Jerome Henderson, Edgar Lacey, Glenn McDonald, Billy McGill, Mike Niles, Sam Robinson. L.A. Westchester (6***): Hassan Adams, Trevor Ariza, Bobby Brown, Amir Johnson, Gabe Pruitt, Sam Williams. L.A. Verbum Dei (6•): Ken Austin, Lewis Brown, Kenny Fields, David Greenwood, Roy Hamilton, Andre Miller. L.A. Fairfax (5): Larry Friend, Sean Higgins, Solomon Hill, Chris Mills, Craig Smith. S.F. Lowell (5): Bill Calhoun, Howie Dallmar, Bob Feerick, Frank Kudelka, Tom Meschery. Simi Valley Stoneridge Prep (5••): Jonathan Gibson, Taj Gibson, Enes Kanter, Hamady N’diaye, Nikola Vucevic. Reseda Cleveland (4): Lucious Harris, Adonis Jordan, Trevor Wilson, Nick Young. S.F. Galileo (4): Bruce Hale, Marty Passaglia, Fred Scolari, Gene Williams. L.A. Jordan (4): Art Harris, Ron Riley, Paul Scranton, Bob Sims. L.A. Manual Arts (4): Normie Glick, Andre Spencer, Dwayne Polee, Freeman Williams. Morningside (4): Elden Campbell, Stan Love, Jackie Robinson, Byron Scott. Pasadena (4): Michael Cooper, Michael Holton, Jim Marsh, Forrest McKenzie. Fresno San Joaquin Memorial (4): Brook Lopez, Robin Lopez, Cliff Pondexter, Quincy Pondexter. Oakland Skyline (4): Eric Fernsten, Greg Foster, Gary Payton, Peter Thibeaux. Playa del Rey St. Bernard (4): Corey Gaines, Ronnie Grandison, Ed Stokes, Leonard Taylor. S.F. St. Ignatius (4): Fred LaCour, Joe McNamee, Kevin O’Shea, Bob Portman. Woodland Hills Taft (4): Bryce Dejean-Jones, Spencer Dinwiddie, Larry Drew Jr., Jordan Farmer. S.F. Balboa (3•••): Eric Morton, Marlon Redmond, Willie Wise. Berkeley (3): Don Barksdale, Phil Chenier, John Lambert. Oakland Bishop O’Dowd (3): Ivan Rabb, Brian Shaw, Guy Williams. North Hollywood Campbell Hall (3): Aaron Holiday, Jrue Holiday, Justin Holiday. Concord De La Salle (3): Brent Barry, Drew Barry, Jon Barry. Glendora (3): Casey Jacobsen, Tracy Murray, Dennis Van Zant. L.A. Fremont (3): Joe Caldwell, Curtis Rowe, Dane Suttle. L.A. Hamilton (3): Marlon Garnett, Alex Hannum, Sidney Wicks. Lakewood (3): Duane Cooper, Craig Dykema, Tod Murphy. Lawndale Leuzinger (3): Russell Westbrook, Delon Wright, Dorrell Wright. Oakland (3): Jabari Brown, Damian Lillard, Don Lofgran. Pacific Palisades (3): Steve Kerr, Derek Strong, Kiki Vandeweghe. Pasadena Muir (3): Stacey Augmon, Ryan Hollins, Jacque Vaughn. Palos Verdes (3): Mark Acres, Bill Laimbeer, Jan Van Breda Kolff. Riverside Poly (3): Coby Dietrick, Reggie Miller, Bob Rule. Santa Barbara (3): Vic Bartolome, Don Ford, Jamaal Wilkes. 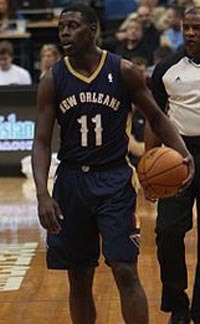 When his brother Aaron gets NBA minutes, Jrue Holiday will be part of a family with three brothers having played in the league. Photo: Wikipedia.com. *Crenshaw’s total does not include Marcus Williams, who left for Oak Hill Academy in Virginia for his senior season and Daniel Hamilton, who graduated from Bellflower St. John Bosco. The Braves have produced Hamilton and James Cotton and Hamilton’s former teammate Tyler Dorsey has played in the NBA, but he spent his senior season at Sierra Madre Maranatha. **Dominguez’s total does not include Brandon Jennings, who played two seasons at Oak Hill Academy in Virginia, where he was named Mr. Basketball USA for the 2007-08 season. **Westchester’s total does not include Jason Hart, a high school All-American who played his senior season (95-96) at Inglewood, which gives the Sentinels one more NBA player than the Comets. •Verbum Dei’s total does not include Dwayne Polee, Ed O’Bannon or Raymond Lewis. Both Polee and O’Bannon played their freshman year for the state’s strongest overall program in the 1970s. Lewis, who is the best player ever from Verbum Dei and one of the most talented guards the state ever produced, was a first round draft choice in 1973 but did not play a regular season game. This list is not based on NBA draftees, but who actually logged minutes in a regular season game. •• Stoneridge Prep is now closed and was part of the CIF for a short period of time. After it left the CIF ranks, the program accepted post-graduate players. ••• Great ABA leaper Darnell Hillman attended Balboa from some time, but graduated from Hiram Jonson of Sacramento. The talent produced by the city of San Francisco was strong in the early days of pro basketball and inner-city L.A. City Section programs have traditionally produced the strongest basketball in the state, although the section is currently experiencing a downturn compared to its heyday of the 1970s through the early 2000s. In fact, there are seven L.A. City programs that have produced four or three NBA players and even though a few of those haven’t produced a NBA player in two generations, those schools have still produced more NBA talent than 98 percent of the programs in the state. When looking at some strong basketball programs, it was a bit of a surprise to see Lynwood and Fresno of Edison have only produced two NBA players apiece. Perhaps 1990 Cal-Hi Sports D1 State Player of the Year Earnest Killum could have helped Lynwood meet the cutoff mark, but he tragically died during his sophomore season at Oregon State in 1992. Edison has produced Bruce Bowen, who dropped 42 points on eventual D1 state champ L.A. Crenshaw in the 1989 SoCal regional, and Torraye Braggs, who actually spent time as a reserve forward on Edison’s 1993 team that also featured all-state forward Terrill Woods and the late Melvin Mason. We counted Aaron Holiday as the third Holiday in the NBA, as it’s pretty likely as a 2018 first round draft choice he’ll play at least one game in the league. Both Encino Crespi and Los Angeles Loyola have produced two NBA players, but we didn’t yet count D’Anthony Melton for Crespi or Thomas Welch for Loyola just yet because as 2018 second round draft choices, there is no guarantee they’ll log minutes. Two teams have had three eventual NBA players on its active roster at one time during the same season among the approximately 20 we could find nationally: the 2001-2002 L.A. Westchester team that included wing Hassan Adams, forward Trevor Ariza and guard Bobby Brown and the 2005-2006 San Joaquin Memorial club that included big men Brook and Robin Lopez and forward Quincy Pondexter. Westchester finished 32-2 and won the D1 state crown, while San Joaquin Memorial went 33-4 and was upset in the SoCal D4 regional final by Horizon of San Diego. Pondexter’s uncle Cliff and his dad Roscoe were two of the greatest players ever in CIF Central Section history and we always took for granted Roscoe (our 1971 Mr. Basketball choice over Raymond Lewis) logged NBA minutes to give the program five overall. Roscoe was drafted in the third round in 1974, but never played in a NBA game. After one year of college, Cliff was a first round draft choice that same year, but he sat out his rookie year because of a stress fracture and never fully reached the NBA heights that was expected of him while in high school.